So this was pretty cool. I don’t read a lot of DC comics (and by this I mean any) on a regular basis, but I was getting a lot of suggestions from people that this was going to be a great book. My intention was to stick to the 8 issue mini-series and not buy in to all of the tie-ins and spin-offs that are bound to be a part of this event. However, when I went to my local comics shop last week, they didn’t have any more copies of North 40 so I used the money to pick up an issue of Green Lantern that serves as a prelude to Blackest Night. I’m probably going to spoil things that happen in these issues, so consider yourselves warned. Green Lantern #43 (GL43) was totally creepy and a clear example of a comic that isn’t meant for kids. It tells the back story of the Black Hand (a character I have no familiarity with (like a lot of DC characters)) and how throughout his life he’s been surrounded by death. I got what was going on though and how he was selected to lead the Black Lanterns (a group of undead villains powered by brings rings and a black battery in Space Sector 666), but what I don’t understand is why this is happening now. Is it because Hal Jordan (The Green Lantern) and Barry Allen (The Flash) came back from the dead? 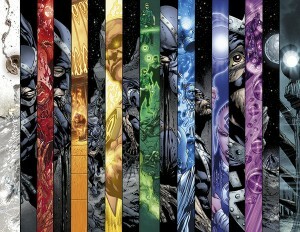 Or is this one of the mysteries of Blackest Night? The main thing that might be missed in this issue if you didn’t read it is the life history of the Black Hand, his transformation into the leader of the Black Lanterns and the fact that the Oa gnome with the scar on his face is the one who seems to have started the whole thing. 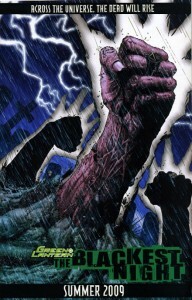 The main event, Blackest Night #1 was a really fun book. Granted it was more set up for the most part (although it’s set up for the entire DC Universe), but a number of significant things happen. Hawkpeople are murdered, Bruce Wayne’s skull gets carted around town (although I have suspicions that it isn’t actually Batman’s skull), and thousands of Black Lantern rings distribute themselves across the universe awakening the dead to serve in their mission to kill everything. 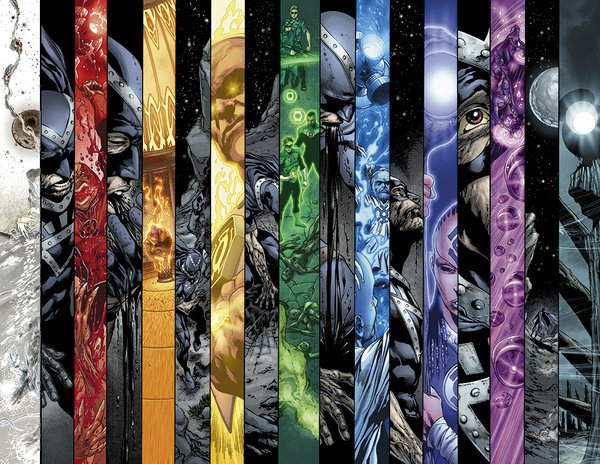 A nice background is given for the Green Lanterns of Earth, most of whom I have only most cursory of knowledge of. My only complaint is that in a few scenes names were being thrown around that I didn’t recognize and I wasn’t sure what the significance was. The book made me want to know more though. The artwork was top notch, and rendered an amazing number of characters (both living and dead) beautifully (and incredibly creepily). I’m intrigued. I will certainly continue with Blackest Night, and I’m even interested in checking out the back story of how everything got to this point. So this Blackest Night stuff is pretty cool. I don’t read a lot of DC comics (and by this I mean any) on a regular basis, but I was getting a lot of suggestions from people that this was going to be a great book. My intention was to stick to the 8-issue mini-series and not buy all of the tie-ins and spin-offs that are bound to be a part of this event. However, when I went to my local comics shop last week, they didn’t have any more copies of North 40 so I used the money to pick up an issue of Green Lantern that serves as a prelude to DC’s new event series, Blackest Night. I’m probably going to spoil things that happen in these books, so consider yourselves warned. Green Lantern #43 (GL43) was totally creepy and a clear example of a comic that isn’t meant for kids. It tells the back-story of the Black Hand (a character I have no familiarity with (like a lot of DC characters)) and how throughout his life he’s been surrounded by death. I got what was going on and how he was selected to lead the Black Lanterns (a group of undead villains powered by black rings and a black battery in Space Sector 666), but what I don’t understand is why this is happening now. Is it because Hal Jordan (The Green Lantern) and Barry Allen (The Flash) came back from the dead? Or is this one of the mysteries of Blackest Night? The main things that might be missed if you didn’t read this issue are the life history of the Black Hand, his transformation into the leader of the Black Lanterns, and the fact that the Oa gnome with the scar on his face is the one who seems to have started the whole thing. The main event, Blackest Night #1 was a really fun book. Granted it was more set up for the most part (although it’s set up for the entire DC Universe), but a number of significant things happen. Hawkpeople are murdered, Bruce Wayne’s skull gets carted around town (although I have suspicions that it isn’t actually Batman’s skull), and thousands of Black Lantern rings distribute themselves across the universe awakening the dead to serve in their mission to kill everything. A nice background is given for the Green Lanterns of Earth, most of whom I have only the most cursory of knowledge of. My only complaint is that in a few scenes names were being thrown around that I didn’t recognize and I wasn’t sure what the significance was. The book made me want to know more though. The artwork was top notch, and rendered an amazing number of characters (both living and dead) beautifully (and incredibly creepily). I’m intrigued. I will certainly continue with Blackest Night, and I’m even interested in checking out the stories that got everything to this point. *Thanks to the commenter below for the correction. I’ve been loving Geoff John’s Green Lantern material. My buddy turned me on to Rebirth and I’ve been catching up like a mad man. I agree. I’m fairly certain this is the best Green Lantern comics have ever been… Certainly in my lifetime anyway. I’ve heard nothing but good things about the current Green Lantern run and I’m wishing I had read some of it before now. I know I’d be getting a lot more out of Blackest Night if I had. DC stuff is just always difficult for me to get into since I live in the Marvel Universe according to Angie. stop by, and i’ll get you all caught up. either verbally or with trades. FYI: Indigo = Compassion. It isn’t unknown.